The cold temperature on March 13th was accompanied by a biting wind. Snow and ice covered the ground and streets but the inclement weather didn’t deter a huge crowd from thinking of spring and summer. Dozens of committed volunteers filled the Drill Hall advertising their programs and services and taking registrations for the spring and summer programs. It was the annual Community Learning Council and City of Wetaskiwin’s launch of the Spring & Summer Program Guide and hosting of the annual Spring Parade of Programs. During the evening people took advantage of this opportunity to talk to instructors, program providers and coaches. It was an ideal opportunity to explore ideas for new things to do during the upcoming spring and summer and register for all the family’s activities at one location. Kids and Teens: soapstone carving, dream catchers, paper crafting, pottery, jigsaw hanging lamp, summer camps for children and youth. Teens: quilting, embroidery, wheel pottery, melted wax art, sculpting in clay, hummingbird feeder, gardening. Adults: writing group music instruction, quilting, theatre group, museum events. Public library: programs (lego, movies, reading club, day camps). Health and fitness: yoga, zumba, karate, health workshop, mental health week. Sports and fitness: gymnastics, football, soccer, Tia Chi, roller derby, ball. First aid and safety: babysitting course, emergency first aid, child care first aid. Swim programs: Red Cross water safety courses, Lifesaving Society National Lifeguard and Aquatic Emergency Care course, swimming lessons. 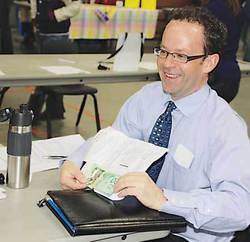 Adult education courses and ESL programs: firewood, water wells, English language, business development workshops by a video conference, academic upgrading at NorQuest College, pilot training, gardening, computers for seniors. Community support: Wetaskiwin And District Victims Services, anger management, Camrose Women’s Shelter Society, McMan Youth Family and Community Service Association. Prior to the event, a 68 page program guide was distributed throughout Wetaskiwin and region advertising the event and programs and services in the community. Want to become more active this spring and summer… check out the 68 pages of activities outlined in the Guide.